U.S. 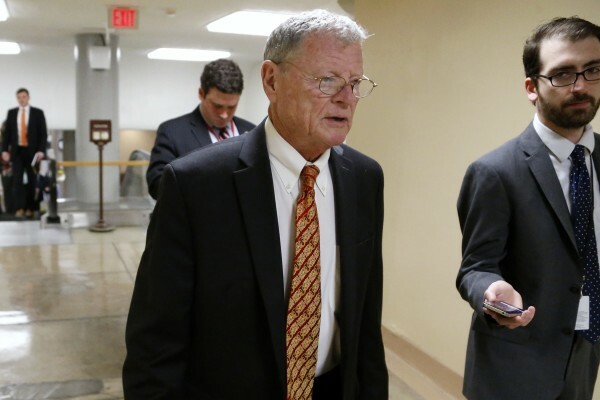 Senator James Inhofe (R-OK) (C) is greeted by a reporter as he arrives for the weekly Senate Republican caucus luncheon at the U.S. Capitol in Washington January 13, 2015. “Only in the halls of Congress is this a controversial piece of legislation,” Schatz said. The Senate, with Inhofe’s support, did pass a separate measure saying that climate change is real — just not that human activity is a cause. Sen. Roger Wicker, R-Miss., was the only senator to vote against it. The Democrats pushed for the climate change votes as an attempt to get Republicans on the record in advance of the 2016 elections, with polls showing that a majority of Americans believe humans are causing global warming. The votes were offered as non-binding amendments to the bill authorizing construction of Keystone. Sen. Lisa Murkowski, R-Alaska, urged her colleagues to vote against the finding that climate change is significantly caused by humans. Murkowski, chairwoman of the energy committee, has expressed worries about the impact of climate change on her state. But she said on the Senate floor that the fact the measure included the word “significantly” was enough to merit voting against it. President Barack Obama mocked the “I’m not a scientist” line in his State of the Union speech on Tuesday night. “Well, I’m not a scientist, either. But you know what? I know a lot of really good scientists at NASA, and NOAA, and at our major universities,” Obama said. Scientists from NASA and NOAA announced last week that 2014 was the hottest year on record, continuing a warming trend that the scientists attributed to greenhouse gases from the burning of fossil fuels. Just five Republicans, including Sen. Lindsey Graham of South Carolina, joined the Democrats on Wednesday in voting for the finding that human activity significantly contributes to climate change. Graham said he’s not a scientist, but that he has heard enough from scientists on the issue to be convinced. He rejected Democratic arguments that approving the Keystone XL pipeline would worsen climate change, though, maintaining that the Canadian oil sands are going to be developed even if the pipeline is not built.